What’s remarkable about the ultrathin flash memory device Dr. Giovanni Fanchini holds in his hand isn’t the size but its composition. At 10 nanometers (nm), the sleek new polymer material that makes up the device is 10,000 times thinner than a single human hair, and a fraction of the 30 nm minimum to 80 nm of a typical flash drive. The organic, carbon-based polymer could revolutionize the production of memory devices for increasingly smaller and lighter smartphones and tablets. Design criteria related to organic polymers also pave the way for devices with greater memory capacity. “The amount of information we need to store, handle and use is getting bigger all the time,” says Fanchini, Canada Research Chair in carbon-based nanomaterials at Western University. When IBM introduced the first hard disk storage device in 1956, it was the size of a cupboard, stored just 5 MB of data – a huge amount then, but now the equivalent of one song – and was prohibitively expensive. Today, memory cards as small as a fingernail store 128 GB of data, enough to hold 32,000 songs, 27 movies and 250,000 photos. A common USB flash drive of 64 GB costs $30. Yet technology continuously demands smaller, lighter, cheaper devices with more capacity. IBM and others in the industry have been researching a new kind of memory chip called a memristor (from “memory” and “resistor”). The component regulates and remembers the electrical current that flows through it and is typically made of inorganic material like silicon. This standard material can retain information without an external power source and can be writable, readable and erasable multiple times. But costs are high and the material isn’t thin enough, at more than 15 nm. 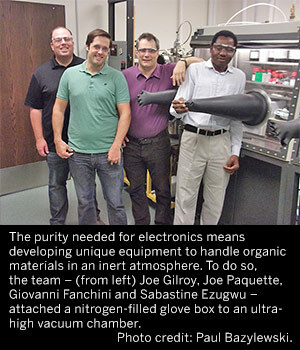 Dr. Fanchini, Dr. Joe Gilroy, from the Department of Chemistry and the other members of their teams – PhD candidates and research assistants Sabastine Ezugwu and Joseph Paquette – didn’t start out researching flash memory devices. They were actually applying a new ultrathin radical polymer material for use in solar cells. 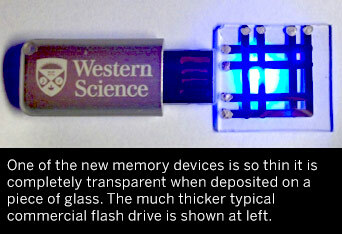 So it’s as remarkable as the material itself that this new class of memory devices is possible thanks to serendipity. “Research doesn’t always go as planned, so you have to let go of what you’re looking for and instead ask, ‘what can be done with this new material?’” explains Fanchini. That eureka moment is exactly what happened one night when the material refused to work as expected. The research team put their heads together to determine what was going on. “In materials science, there are two different approaches you can take with a building block that has unique properties,” Gilroy says. “When you find memory effects, as we did, in a material that is so different from what is used today in commercial flash memory sticks, the challenge is to discover the right design that will exploit the properties in the best way,” Fanchini says. “Dr. Gilroy and I created the material, trying different derivatives to ensure stability and a reliable molecular weight distribution so it would perform the same from one trial to the next,” Paquette says. The fourth generation of the material – an organic thin film based on carbon, an element used in plastics and found in all living matter – overcame the challenges. It went to Fanchini and Ezugwu to develop the device. Serendipity may have played a role in the research beginning, but collaboration and hard work will take it beyond its first iteration. To get to the point of commercialization, the research must demonstrate that the material can be scaled up to handle trillions of bytes of memory. It’s a stretch, but in the distant future, understanding organic material in electronic devices may lead to understanding more complicated systems like human memory. You may read the full paper in the journal Advanced Electronic Materials.